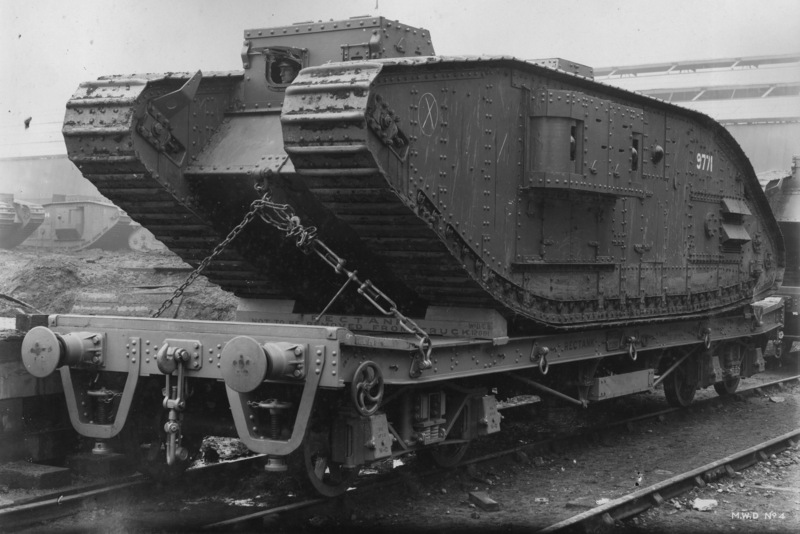 A 1918 tank is loaded onto a Swindon-built RECTANK wagon. The wagon was built to carry tanks and other armoured fighting vehicles weighing up to 40 tons. As shown here, tanks were driven onto the wagons, not craned on. Mr Hardy said: “I am reasonably certain that this is a Mark V tank, though it is just possibly a Mark V* (from that angle it is almost impossible to tell). Assuming that it is a Mk V, then the interpretation of the phrase “a 1918 tank” in the caption becomes an issue. “The Mk V was really just an improved version of the Mk IV, while the V* was a newer machine altogether; in particular it was considerably longer and different in a number of ways to the Mk V. It was scheduled to go into production after the first order for 400 Mk V’s was completed. “The decision to start production of the Mk V was finally taken in the late summer of 1917. The original intention had been that they would be ready for use by the autumn of 1917 and the first few new Ricardo engines which were to go into the Mk Vs in place of the Daimler engine used previously in tanks reached the Central Workshops at Erin in France in Aug 1917. But the first model did not come off the production line until Dec 1917 and the first deliveries were made to Central Workshops on Jan 14th 1918, after which there was another long delay, probably aggravated by the chaos and panic of the March Retreat, and it was May 1918 before any regular deliveries started to arrive in France, followed quite quickly by the first V*s.
“Personally I would still call the Mk V a 1917 tank but I accept that you could argue that as none reached France until January 1918, the present caption is correct. For details about Warminster Museum, click here. It is lengthened, as can be seen by the extra machine gun mount behind the sponson, and the door beneath it, both of which a Mark V doesn’t have. So it is a Mark V*. I have been interested in armoured warfare from a young age, but my main interest is with WW2 stuff, I do know a few things about WW1 armour though. I was Googling for some good images of British WW1 tanks, which is how I ended up at your website. The mark V* tanks were lengthened versions of the Mark V, in order to provide room for a squad of soldiers, to function as armoured personnel carriers so to say, a new concept at the time. “This wasn’t a success though, because the soldiers became incapacitated by the heat and smoke inside the tank, the first produced by its engine, and the latter by both its engine and from firing its weaponry in combat. As far as I know some 700 mark V* tanks were built, 500 “male” and 200 “female” variants, the one in your image is a “female” (armed with machine guns only). The tank’s serial number, 9771, is visible in the image, so if you want to know more about this tank you might try contacting the Tank Museum in Bovington (http://www.tankmuseum.org/contact-details ), they might be able to provide you with its history. Regarding the mark V* tank; you should see it more as a ‘battle taxi’ than as a real armoured personnel carrier (APC). The difference being that an APC is the dedicated transport for a group of soldiers both on and off the battle field, and a battle taxi only transports them on the battlefield itself. I don’t know how many soldiers the mark V* was supposed to transport exactly btw, might have been a full squad, might also have been more or less. That’s something the people at the Bovington Tank Museum should be able to tell you. The only surviving mark V* resides at the National Army and Cavalry Museum in Fort Benning (US), but that’s a “male” version, of the “female” version no survivors remain. The mark V* was not just a lengthened version of the Mk V, it was a new design altogether. Frans is very close in his estimate of the numbers built. In fact, of the original order for 700 (500 males and 200 females) 579 were delivered by Armistice Day and another 66 subsequently; I think the rest of the order was cancelled. It is slightly surprising (to me at any rate ) that Metropolitan Carriage Works should have completed their original order for 400 Mk Vs before they started on the V*s.
Thank you for your note about the Mark V* tank. I have checked the position of the door on the working drawings and compared it with the Mk V. I congratulate you on your perspicacity and am now in full agreement with you. Glad to be of help, and thanks for the compliment. My best wishes for you and the museum, history is important. So we have now reached the point when everyone is now satisfied that your original caption calling it a 1918 tank was perfectly correct and I should not have presumed to think anything otherwise. Well done! It is lengthened, as can be seen by the extra machine gun mount behind the sponson, and the door beneath it, both of which which a Mark V doesn’t have. Frans is correct. The tank 9771 appears on this list of Mk V*s which might be helpful. Oops. This time with the link. So it does, thank you for another confirmation!